As I rolled over in my hotel bed, my eyes slowly began to flutter open. Despite the blurriness caused by my terrible eyesight, the first thing I saw were the pretty, fairy floss colours decorating the sky. 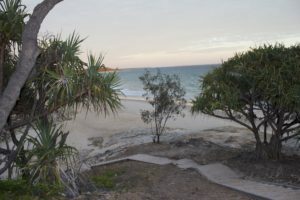 I sat up, ignoring my slight headache (which no doubt came from the red wine I had overindulged in the previous evening) and checked the time – it was 5:30am on North Stradbroke Island. I crawled out of bed, and quietly made my way out of the room. I walked outside the Straddie Pub and wandered down the short path leading down to Cylinder Beach. The air was cool, and the pink horizon had cast an inimitable light over the ocean, turning the water into an incredible shade of turquoise. Smiling to myself, I slowly made my way down the stairs towards the sand. Sunrise swims are the best way to wake up! As I reached the bottom of the wooden staircase, I sunk my feet into the cold sand, and closed my eyes. It was nearing 6:00am, and the sun was just about to pop out over the headland to my right, so I tossed my belongings onto the nearby rocks and made a beeline for the water. The warm, salty ocean welcomed me with open arms as I tossed myself under the waves. I swum beneath the surface for a couple of metres before emerging behind the break, feeling invigorated. Any remnants of my earlier headache had been washed away by the salty sea, leaving me feeling fresh and awake. I floated on my back as I watched the sun appear; the bright, early morning sunshine flooded the shores of Cylinder Beach, lighting up the crystal-clear water like magic. I dove again under the waves, this time towards the shore. As I emerged from the warm, salty water and felt the heat of the sun on my skin, I had a bit of a moment. A smile crept across my face once again, and I took in the moment in all its glory; the incredibly warm ocean, the glorious sun beaming down upon me, and the fact that not a single other soul was sharing the beach with me. “I’m so glad I got out of bed for this”, I thought to myself, and not a second later I spotted a fin darting through the water. From my spot on the shore, I watched as about ten dolphins made their morning commute past the sandy beach just metres from where I stood. A couple of them began chasing fish in the shallows; whizzing through the water at rapid speeds, while the rest casually navigated the waves. I watched in amazement at the sight before me; I’d never seen dolphins so close before. Fear was the only thing holding me back from running back into the surf and joining the dolphins on their voyage, but to be honest I was just as happy to observe from the shore! As the dolphins continued their journey up Cylinder Beach, I gathered my things and made my way back to the wooden staircase. I looked over my shoulder back towards the ocean, and knew that this would always be a morning to remember. Waking up on North Stradbroke Island was something I’ve wanted to do ever since the first time I travelled there for a day trip back in May last year. Realising that a day trip just wasn’t enough time on the island, my soul sister Kobi & I decided to spend the night this time around. We arrived on North Stradbroke Island (or Straddie, as it is affectionately known to the locals) late on a warm Friday afternoon. We’d opted for the vehicle ferry, meaning we’d have the freedom of a car during our time on the island, rather than relying on public transport. As we disembarked in our questionably coloured hire car (rust orange, anyone? 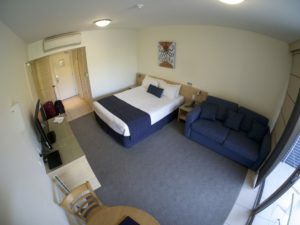 ), we trusted our memories of past day trips to get us to our home for the evening – the Stradbroke Island Beach Hotel, a.k.a the Straddie Pub. 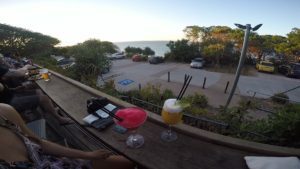 The Straddie Pub is located right next to the gorgeous Cylinder Beach, and offers spectacular views of the Pacific Ocean from its position on the headland. Upon arrival, we promptly checked in before heading up to our room to get changed. Then, we headed straight down to the Wave Bar to sit back and relax with a much-needed Friday afternoon cocktail. The view from the Straddie Pub at sunset was simply stunning. As we sipped our fruity drinks, we watched in awe of the ever-changing colours of the sky; switching from glowing yellow to pastel pink, then finishing with a deep indigo as the sun retreated for the night. I don’t think I’ll ever tire of watching the sky transform like magic at the beginning and end of each day! We then continued our evening in the Manta Ray Bistro, laughing together as we caught up on each other’s lives while indulging ourselves with some delicious food. The vibe in the restaurant was lively and energetic, and the service was quick and friendly. After finishing our dinner, we headed downstairs to the bottle shop, grabbed some red wine and continued our festivities in the hotel room. After a quick nap following the incredible morning I described earlier, Kobi and I left the Straddie Pub to find some breakfast. Last time we visited the island, we’d had a great meal at The Blue Room, a quaint, quirky café at Point Lookout, so naturally we returned for another. The Blue Room is exactly what I’d love to have if I was to ever own a café. With incredible views, diners can watch over the blue ocean in the hope of glimpsing a whale passing by while enjoying brekky. The tables and chairs were of an eclectic style, and no table was the same. Have you ever been to a café, bar or restaurant and instantly felt as though you were home? That’s what it was like at The Blue Room – a welcoming, homely place with plenty of quirk and fun, not to mention the food was incredible! Check it out if you’re ever on the island – you won’t regret it. As most of you probably already know, I am absolutely obsessed with the beach. 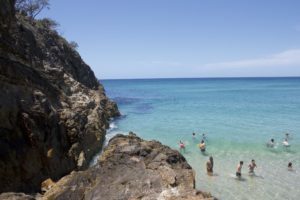 It is, and always has been, my favourite place to be, which is why I was so excited to explore some of the beautiful beaches of North Stradbroke Island. After breakfast, Kobi & I were fuelled and ready to spend the rest of the day beach-hopping across as many of Straddie’s sandy shores as possible. We headed toward Main Beach, and found a cute little cove between the headlands to explore. We threw our towels on the hot sand, and rushed immediately to the water for a refreshing dip. The surf was big, and we dodged, ducked, dipped, dived and dodged the walls of blue water smashing against the rocks, each wave dousing us with the warm, salty ocean spray. Some of the clearest water in the world! After our swim, we retreated to the sand and enjoyed the sunshine; the cove was protected from the wind and we could lay back and enjoy our surroundings. There were plenty of others on the beach, many with dogs (much to our delight). It was a great place to lie back and people watch, and I wondered how many were locals and how many were visitors. I daydreamed about being a local on an island like Straddie; the lifestyle was something to envy, and the stunning natural surrounds would be like living in paradise every day of the year. Finding myself feeling a bit restless on the sand, I decided to climb up the rocks on the headland. With my camera tossed over my shoulder, I scampered up the sharp rocks like a monkey, carefully avoiding the wet, slippery sections like a pro. Once I reached the top, I observed the view from above, like a queen watching over her salty kingdom. The water was incredibly clear, and even from my position atop the rocks I could see the ocean floor as clear as if I was floating above it. It was obvious why this place was such a popular swimming spot! After a while, we decided it was time to explore another beach on the island. We headed back up toward Point Lookout, and wandered along the headland. From there, we saw a long stretch of a secluded sandy beach that was just screaming for us to go and check it out. Noticing that there was next to nobody down there, we decided to investigate. Frenchman’s Beach, as it turned out to be, was just a short walk down a wooden staircase accessible from the top of Point Lookout. As we strolled down the steps, we took in the spectacular view before us; we could see glimpses of the strikingly blue water and white sand through the ponytail palms, resulting in a colour contrast that will always remind me of paradise. The surrounding bushland was luscious and green, and we could hear the chirps and cries of the local wildlife coming from every direction. When Kobi and I eventually reached the bottom of the stairs, we headed straight for the water. Sinking our toes into the wet sand, we walked the entire length of Frenchman’s Beach, admiring the colour of the water (seriously, it will never cease to amaze me) as we battled the wind, heading to seek protection from the rocks at the other end. Finding a relatively wind-free spot below the rocky headland, we made camp. The next couple of hours were spent swimming in the salty waves, sunbaking on the sand and exploring the many little rock pools that call Frenchman’s Beach home. We had one of those conversations where you talk about your dreams, but in the way that makes them seem like a real possibility right there and then. We discussed how we’d move to Straddie, we’d open a business, and we’d live in a little shack on the headland that we’d passed earlier in the day. Our dreams felt so real in the moment, and for a second I didn’t think we’d ever actually leave the island. It was too perfect. Our plan to ditch our real lives and live a life of leisure on the island was rudely interrupted when we realised that we were very, very hungry. You see, when you spend your day in the glorious sunshine, soaking up that essential Vitamin D, swimming in the sea and lounging in the sand, you tend to work up a bit of an appetite. So, we left the gorgeous Frenchman’s Beach in search of the only thing that could wake us from our daydream – food. We grabbed lunch at a little café in Point Lookout before making our way back to the water for our last couple of hours on the island. We wanted to go back to Cylinder Beach, the place where I had spent my magical morning, but when we arrived it was absolutely blowing a gale. The idea of trying to lie on the beach while sand whipped us from every angle wasn’t appealing, so we decided to head back to the protected cove next to Main Beach. The enormous waves from that morning had settled, and we found the cove to be even more delightful than before. It was calm, and the afternoon sun cast a warm glow over the beach. Again, I threw my stuff on the sand and went straight towards the ocean. As soon as my feet hit the water, I ran as fast as I could through the waves, diving under those too big to pass through. I made it behind the break, and again found myself floating on my back with the sun in my face, feeling more at home in the ocean than I do anywhere else. As the sun began its descent, it was time for us to leave North Stradbroke Island. We drove back along the main road towards Dunwich, where we’d then board the vehicle ferry and begin our return journey to the mainland. It was, as it always had been each time we left, a bittersweet farewell. We vowed that next time we’d spend even longer on the island, maybe a day or two or a long weekend.